Crystal Liu (劉亦菲) is widely known for her delicate image and celestial elegance in ancient dramas. The 30-year-old actress also broke into the Hollywood market and has been cast as the lead in Disney’s live-action adaptation of Mulan <花木蘭>. Recent photos of Crystal’s home shows how much wealth she has accumulated over the years. Although Crystal’s parents separated when she was young, her father is a well-learned and respected professor. Her step-father is also allegedly very wealthy. Crystal also has an extremely wealthy godfather. 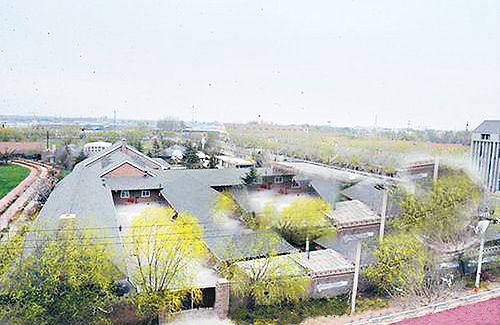 Her primary residence in Beijing stands at approximately 180,000 square feet and is worth nearly $1 billion RMB. The luxury mansion boasts numerous rooms, each with its own distinct purpose, such as a piano room, a dance room, while another is used as a theater. Crystal is also known as a cat lover. She often adopts abandoned cats and takes them to the veterinarian for treatment. On average, her home is residence to approximately 30 cats. At its highest peak, Crystal owned nearly 50 cats. Not only does she exude an air of celestial elegance onscreen, but Crystal seems to have a heart of an angel too! However, Crystal may not be as soft and passive as many may think. Surprisingly, Crystal is also a car enthusiast. Her garage is filled with luxury sports cars, including a $1 million RMB Porsche, a $4 million RMB Ferrari 458 Speciale, as well as a Bentley. I don’t understand the fascination with LYF. I really think she’s bland, boring & not interesting. Not even that pretty. Acting’s mediocre. Too many mediocre artists in the world. @coralie could not agree more. I don’t get the big deal about her either. I definitely agree with you that there are too many cheeseburger artistes out there. @coralie seriously when will people stop thinking that you have to be “pretty” to become an actress. I wish Asian people would adopt the same mindset as foreigners when it comes to choosing actors/actress. I’m so sick of seeing mediocre actress with super pretty look. I think LYF has a unique acting style and a unique face like a classic beauty look you see in a Chinese romance novel. How true! why can’t fans place priority on acting instead of demanding physical perfection for actresses? This is probably why the pretty angelababy gets chosen for leading roles and totally undeserving high wages. @coralie could not agree more with what you and @vell had to say. Unfortunately, society has become more shallw than ever and the studios cater to that fickle mindset. Angelebaby is overrated and overpaid, with little to no acting talent. Her looks are not even her original looks. She and her husband has a lot in common with credit cards, lol. I have watched movies and dramas from all over the world. Some of the actors/actresses were not the best looking, but they sure could relate to the viewers through their characters. That is what acting should be about. 50 cats!!! I can understand one raises 10 or less, but 50 cats. That’s an obsession. I hope that is not one of the reasons that she and her Korean actor boyfriend broke up (SSH?). @dramas4me maybe they broke up because she reeked of cat and not perfume, lol. Just having a fun thought. I honestly don’t know how people deal with that many cats/dogs at the same time. I like dogs, but not cats. Many years ago, we were looking to buy a house and our agent took us to a cat house. The lady had over 40 cats. We walked in & immediately I had to run out. I couldn’t breath & the smell was so bad. I started to feel itchy also. Some people have serious allergies with cats/dogs. I think I’m one of them. I think even they keep it very clean – the smell will still be there. I think one of the worst thing about owning too many pets will be is the sadness once they are ill or pass away. Owning one pet is already a big commitment but too many will not be good for the mental state. I agree that with you. Each time a pet dies and one has to endure that. That is very heart breaking. @dramas4me yup, that is a lot of cats. Even with hired help to assist with cleaning and feeding, there still will be a strong, unpleasant smell lingering around. @bubbletea with good cleaning, they dont smell. If she has a massive house, the litter area is obviously nowhere near. Cats dont smell anywhere as bad as dogs drama4me. There’s a reason for the terms “smells like dog” or “dog breath” and none for cats because they self groom and are the most OCD creatures you can have for a pet. The only reason it will smell is if the owner doesnt clean up the mess properly, just like if you dont clean your own toilet properly. that’s a lot of poops to clean..
I’m sure she has an army of pooper scoopers helping out. I hope her cats are spayed/neutered.. if so, I applaud her for giving home to 50 over cats as she has the ability to do so. It’s so sad seeing those stray homeless cat not having enough to eat sometimes. @cassiemissy Best is to spayed the cats to reduce unwanted cats. Otherwise they are destined to a life of misery,abuse and eventually being put down. I do not think home shelters keep them forever more because iof the costs. If LYF is a cat lover, she can fund free spaying services for animals esp. dogs and cats. Lol you can do bit more research and report that LYF doesn’t own all 50 cats instead she rescues these stray cats, feed & care for them as she looks for long term homes for them. @affl that’s good, but I can’t help but think she’s a cat lady. She’s pretty, however, she’s so bland, that I couldn’t love her as an actress.